What Do You Run For? is Nashville’s #1 race series promoting healthy, active lifestyles and providing the communities of Greater Nashville with memorable racing events; each supporting a local community or organization in need. The Nashville Geek team built a new custom website that is mobile responsive, clean in design, user friendly and allows for quick & easy updates. 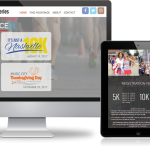 It features customizable race pages to match each races individual color scheme, race results integration, volunteer sign up & original event photography.